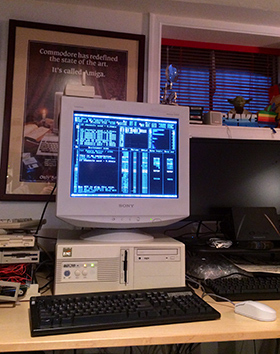 Back in November I became inspired by the knowledge that my favorite old school DOS MODplayer had “recently” received an update, and expressed my intention (part 1) to more-or-less recreate the 486-class DOS PC upon which I enjoyed many, many hours of MOD music, scenedemos and games back in 1996 or so. A number of twitter pals urged me to film the build, so I did, but it’s a pretty rough production, I must confess. Still, those wanting to see this system come together, here it is. 17 Responses to Behold: The 5×86 System Build Is Complete! Blake, what about running NextStep/Intel on it? Such a cool project, glad you managed to get it all done. I’m already rummaging in my spares parts box to see what I might be able to put together. A couple of yeas ago I got myselft a 486 desktop machine too! They are really great machines to play with. That is one awesome project. You got me inspired to set up such a computer myself! I was an Amiga user back in the middle of the 90’s, but some demoscene people I knew had PC’s. Often watched demos with them and we always argued which had the better demos.. Amiga or PC.. :D Things got quiet when The Black Lotus won The Gathering 1996 demo party with their Amiga demo Tint.. hehe.. ;) Anyway, enough rambling from my side.. great job on this project dude!!! What demos do you recommend to watch? Have you started second (1997-2001) PC project? I got mine from Rocco at WiredForService eBay store. Contact them directly through eBay asking about the board — they may have one that is not listed online right now.